When faced with foreclosure, it’s important to know your options and understand all the potential solutions that may be available to help you avoid foreclosure. It’s also important to understand what can happen if you fail to take action and foreclosure becomes unavoidable. The process can be stressful, embarrassing, and it can have long-lasting consequences. Walking away from your home voluntarily, may seem like the best solution when your home is valued lower than what you owe. However, this action may lead to financial consequences in the future. In some states, you may be required to pay a portion of your mortgage debt even after the home has entered foreclosure. Also, the impact to your credit may make it difficult to rent or purchase a home in the future. It may be best to explore other options to foreclosure with your mortgage company before making a decision to leave your home. Keep in mind, your mortgage company doesn’t want to foreclose on your home. Just like there are consequences for you, the foreclosure process is time-consuming and expensive for them. They want to work with you to resolve the situation. However, some homeowners simply don’t take advantage of the help available and foreclosure becomes the only option. A foreclosure is the legal process where your mortgage company obtains ownership of your home (i.e., repossess the property). A foreclosure occurs when the homeowner has failed to make payments and has defaulted or violated the terms of their mortgage loan. A foreclosure can usually be avoided—even if you already received a foreclosure notice. 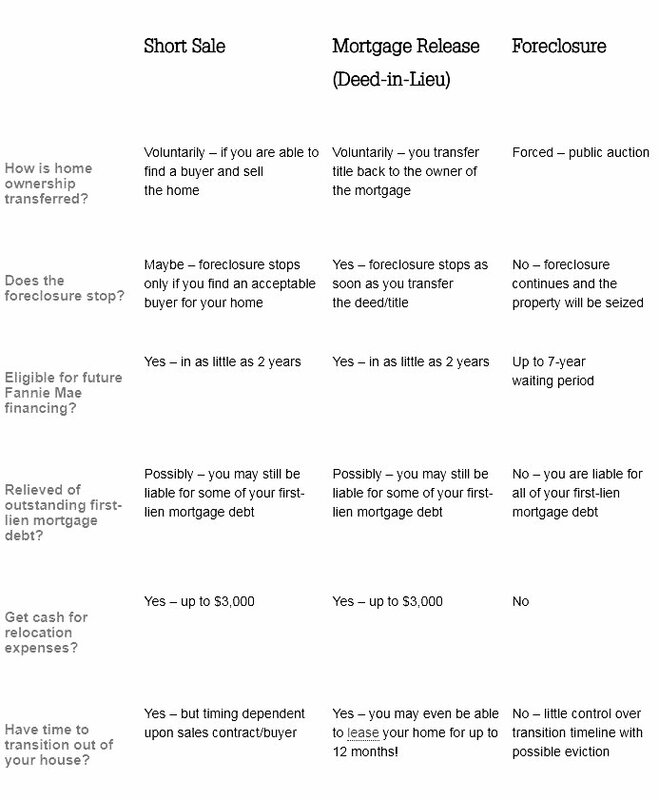 See the chart (in “Foreclosure Comparison”) to compare some other options: Short Sale and Mortgage Release (Deed-in-Lieu of Foreclosure). No matter the option, you must take action as soon as you can. What are the consequences of a Foreclosure? What is the process for a Foreclosure? The process and timing of a foreclosure can vary by state laws, and many other factors. However, your mortgage company can begin preparing the default notice/foreclosure proceedings on your home as early as 60 days after you have missed your first payment. That’s why you should take action early to begin working with your mortgage company to resolve your payment problems immediately. How Do You Avoid Foreclosure? The most important thing—take action now. You have nothing to lose (and everything to gain) by working with your mortgage company to avoid foreclosure. If foreclosure is imminent, other options may no longer be available. However, you may still be able to leave your home without having to go through foreclosure. This means you won’t have a foreclosure on your credit history and you may qualify for relocation assistance to ease your transition to new housing. your income details (pay stubs and income tax returns). 2. Explain your current situation—Be ready to outline your current hardship and explain why you are having trouble making your mortgage payment, why this is a long-term problem and confirm that you are ready to leave your home to avoid foreclosure. Your mortgage company will need to understand the reasons why you are having difficulty in order to find the right solution for you. Contact Your Mortgage Company — Tell them you are interested in a Mortgage Release and you want to see if you qualify. Your mortgage company wants to help you avoid foreclosure and, in most cases, will be willing to work with you. The biggest mistake you can make is to wait any longer to take action. Contact your mortgage company today to determine if you can avoid foreclosure. If you need further assistance (before or after contacting your mortgage company), contact a housing counselor. How is home ownership transferred?